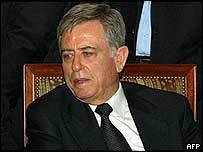 Former Syrian Vice-President Abdul Halim Khaddam - who resigned in June - has accused Bashar of threatening Rafiq Al-Hariri. In an astonishing statement, he says: "Assad told me he had delivered some very, very harsh words to Hariri... something like 'I will crush anyone who tries to disobey us'." It supports claims made by UN Investigator Detlev Mehlis. Khaddam was a close personal friend of Rafiq Al-Hariri, and the only member of the Syrian government to attend his funeral. He also said that the Syrian security services could not have killed Hariri without the personal knowledge of Bashar. Khaddam is now living in Paris, and it's thought today's statement is an attempt to position himself as a replacement for Bashar. Or it could be an attempt to extricate himself from being implicated in the killing: Khaddam was the Syrian government member in charge of Lebanon at the time of Hariri's death. Khaddam - a stalwart of the old guard - was removed by Bashar in June in an attempt to bring reformists into government and replace old faces from Hafez's dirty era. But Khaddam didn't support the changes, and his removal: he said he is "convinced that the process of development and reforms, be they political, economic or administrative, will not succeed". He said today he was cutting links with 'authoritarian' Bashar. For the first time, there is a viable alternative to Bashar. Khaddam: Hafez-lite. France has breathed life into claims of a deal between the US and Syria. A French Foreign Ministry spokesman seemed unusually coy when asked about rumours of a deal: "I ask you to put this question to them [the US]. As for France ... we have been making consultations with [Syria] for months. But we're not in a position to confirm claims of a US-Syrian deal." French diplomatic sources in Lebanon say that President Chirac himself has been involved in the talks. Claims of a deal fit nicely into the otherwise inexplicable silence from Bush on Syria. His tirades were a weekly event until about a month ago. Political sources in Lebanon say Syria has been given a six month 'grace period' to show that it is working with the UN. We lay off you for six months, and then we'll judge you - that seems to be the message. It comes after pressure on the US and France from Saudi, Egypt and the Arab League. Meanwhile Arab League head Amr Moussa has denied reports that he has been brokering a Lebanese-Syrian deal. Lebanon would end support for a UN investigation into the Hariri killing (effectively ending the probe: the UN needs Lebanon's permission to work on their soil) in return for an end to the political killings. Saudi Arabia and Egypt are the names of two countries who keep popping up as mediators in both of those 'deals'. Just like the Syrian-Israeli peace talks of 2000, we wont know that they have officially been taking place until they're over. The long-awaited Arab Parliament, which will be based in Damascus, has met for the first time. The 88 parliamentarians - 4 from each Arab League country - will meet at the new 'Arab Parliament' in Damascus twice a year. It has been set up by the Arab League. The first meeting, however, was in Cairo, the headquarters of the Arab League. The Parliament's been criticised for lacking legislative authority - and it can only discuss issues referred to it by the Arab League. The move to Damascus is seen as democratising the League, which is often seen as Egyptian-controlled. A liberal Kuwaiti has been chosen as the first Speaker. The interim parliament has five years to create a permenent institution. Arab League officials hope the parliament will evenutally have direct elections, like the European Parliament. Some of the Arab World's only 'free and fair' elections have taken place for foreign institutions: Iraqis living in Damascus were recently allowed to vote in Iraq's elections. Yesterday, the Syria News Wire reported that the US had come close to admitting it had flown terror suspects to Syria for torture. It suggests a much closer relationship between the two countries than previously thought. "The ambassador recognised that there had been a media report of a rendition to Syria, but reiterated that the United States is not in a position to comment on specific allegations of intelligence activities that appear in the press." British diplomatic journalist Ewan MacAskill explains the meaning behind the comment and retraction: "The [second] statement is close to an admission of at least one flight to Syria as it would be unlikely to embarrass the ambassador by referring to a media report it considered inaccurate." Abdul Qadir Abdul Qadir is being questioned about the killing of high-profile Lebanese journalist and politician Jubran Tueni in Beirut this month. He is being interrogated by Lebanese authorities about phone calls he is said to have made immediately before an after the killing. He also rents some land next to the murder site in East Beirut. The Syrian-born man was picked up earlier in the month and released. The US has come closer than ever before to admitting it has sent terror suspects to Syria for torture. Syria tortures the suspects on behalf of the US, extracts the information, supplies the intelligence to the US and then hands the suspect back. Syria is one of a number of countries participating in America's 'extraordinary rendition' programme. There had been suspicions that Syria and the US have been working together for years, but it came to a head this morning when a BBC reporter asked the US Ambassador to London whether the US had sent suspects to Syria. His reply: "I don't think there is any evidence that there have been any renditions carried out in the country of Syria." (Robert Tuttle, US Ambassador to London). "The ambassador recognised that there had been a media report of a rendition to Syria, but reiterated that the United States is not in a position to comment on specific allegations of intelligence activities that appear in the press," it read. Bald Nomad - the new Damascene Blog? 2005, the year of the Syrian blog. There's no shortage of words, comment and news about the Levantine country. But Ayman cornered the market in Syrian photo blogs. His Damascene Blog was the only Syrian photo blog. But since Ayman's departure to the US, there's been a paucity of images from Syria. English photographer John Wreford's been based in Damascus for a few years. Quietly snapping Syrian life, his work's finally got a mass-market outlet on the web. His is a fantastic, thirst-quenching view of Damascene life. Enough talking...start looking: Our Man in Damascus. Happy Christmas to all readers across the Arab World and beyond. Midnight Mass is taking place right now in the churches of Bab Touma. 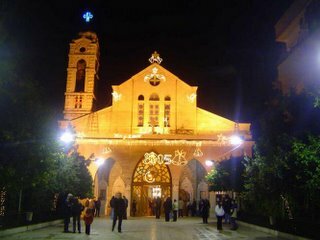 And the bells are ringing across the Old City of Damascus. Britain's Prime Minister Tony Blair says he's willing to start talking to Syria again if they cooperate with the UN inquiry. In a sign that the thaw has begun - it's been weeks since Bush's last onslaught against Syria - Britain has backed off from threatening sanctions against Syria if they fail to cooperate. "I am very happy to have a dialogue with the Syrian government but it has to be on very, very clear terms and it's important they are not only saying these things (on cooperation) but that they are doing them," Blair said. "The fact is there can be no justification for interfering in Lebanon and the Mehlis report was not good reading for Syria, you have to accept that." Syria is bracing itself for one step short of a revolution. Almsot every ministerial post is to change hands, with old faces like Farouq Ash-Sharaa (Foreign Minister) and Mehdi Dakhlallah (Information Minister) making way for reformists. Dakhlallah in particular has come under fire for his lacklustre performance in the Western media. He's to be replaced by an ambassador - a good choice considering the inherent skill of most ambassadors to communicate well. London envoy Sami Khyiami or UAE ambassador Saadallah Agha are lined up for the job. Sharaa has also been blamed for the current crisis - reformists were angry at his provocative UN speech. Prime Minister Naji Al-Otari is also on the way out - likely to be replaced by non-Baathist Abdullah al-Dardari, a close aide of Bashar. And of course, Syria has been without an Interior Minister sicne the suicide of Ghazi Kannan. Bashar's been criticised for the slow pace of economic and politicial reforms, and for not being in full control. His coup d'etat began at this summer's Baath Party Conference - and it looks like this week will the second stage. It has been suggested that the changes were delayed until a respite in international pressure, so that it doesn't look like Bush is dictating the reforms. During a CNN interview, Christian Amanpour asked President Assad of Syria if he is a Dictator. He replied: "But they also say that I am not in control, I can not be a Dictator and not be in control at the same time?" Some foreign journalists and politicians describe the Syrian leader with words suited to a generic dictator like Saddam Hussein. Nothing could be further from the truth. One thing in common between the two is that the current US administration removed the first one, and seems to be starting a process that might lead to the removal of the second one, by chance or by design. Another similarity is that they were both "elected" through soviet era styled elections, and they won with 95%+ margins. But that's where the similarities end. Don't classify him as a dictator. 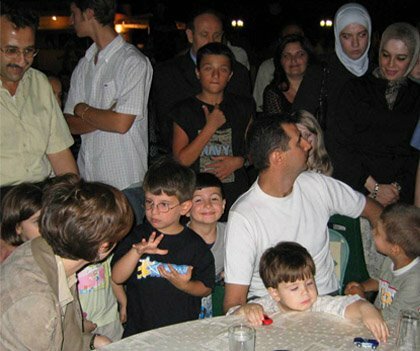 Syrian president Bashar Assad chats with ordinary syrians before having dinner with his wife Asma and eldest son Hafez at an Aleppo restaurant. He drives his own car, wears simple T-shirts and Jeans, pays his own bill, and it all starts when he calls the the restaurant to ask them if they have a free table for him to reserve. Bashar Assad spent his teens and his twenties at his desk studying for his medical school, first in Damascus and later in London. He never drove exotic sports cars, never abused his power as the son of the late president Hafez Assad. Many Damascenes would tell you their stories of when they looked behind them and found Bashar waiting in the same lineup to buy a shawarma sandwich. Unlike the sons of other Arab rulers, he was never a womanizer, never a drinker or a smoker or a gambler. Basha's personal popularity in Syria is probably (there are no proper opinion polls) the highest of any Arab ruler in his country. If there is anything that Syrians criticize him for, it is his hesitation and excessive caution. They want him to move faster on internal political reforms and fighting corruption. With the exception of many Kurds and Muslim fundamentalists, you have a very supportive population. A popular and extra-clean president, with a regime he is trying, slowly, to change. Consider him the president from a moderate opposition party. Lebanon has permenently closed the military lane, next to the Masnaa border crossing. The crossing was used by Syrian and Lebanese officials, the army, and senior businessmen. Always seen as a symbol of corruption in the Syrian-Lebanese relationship, many will be pleased to see the special crossing's demise. Officials with military lane permits were able to cross between the two countries without going through any passport or customs checks (Lebanese and Syrian nations don't need visas or passports to cross the border anyway, they can cross on their ID card). The permits were given as tokens of appreciation by officials, and were available to buy for $2000. Just a day after questions were raised by Mehlis about Syria's co-operation with the UN, he has now praised Syria for making dramatic steps forwards. "Making these five high-ranked intelligence officials available to the commission for questioning, available for extensive interviews outside Syria, which I think required a major effort on the Syrian part," he said. "I think if you had asked someone in Syria a year ago could this happen, I think no one would have believed it," Mehlis said. These are vital words: the UN Resolution passed in October threatens Syria with further action if it failed to co-operate with the UN. "It has been after much hesitation and procrastination that the Syrian authorities finally agreed to move on the request to interview five Syrian officials - whom the commission considers as suspects - in Vienna under conditions determined by the commission." Detlev Mehlis, UN Investigator in a speech to the UN Security Council, explaining in what way Syria 'failed to co-operate'. By requesting that the UN interrogate the suspects outside Lebanon - which Lebanese PM Fouad Siniora also requested - Syria 'failed to co-operate'. 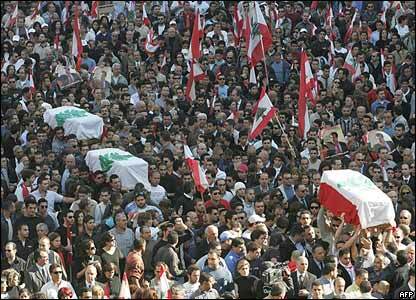 Thousands took to Lebanon's streets. The sea of red and white once again painting the city of Beirut. Jubran Tueni was buried today. The far-right politician and editor of An-Nahar was killed on Monday as his car passed East of Beirut. The mourners shouted anti-Syrian slogans, calling for Lahoud to quit, but Jubran's father Ghassan called for calm: " call on this occasion not for revenge or hatred but for us to bury with Gibran all our hatreds and to call on all Lebanese, Muslims and Christians, to unite in the service of great Lebanon and its Arab cause," he said, invoking the Arabism that the family's newspaper fought against. Jubran and Ghassan backed Michel Aoun's murderous coup attempt in 1990, and fled with him to Paris after thousands of Lebanese had died at the end of Aoun's guns. Pro-Syrian Parliamentary Speaker, the country's most important Shia, said of Tueni: "The glory is yours." Hizbollah Parliamentary leader Mohammed Raad also came out in support of his political enemy: Yours was a "courageous word and uncompromising position," he said. Tueni killing - is Syria being framed? Jubran Tueni was killed today by a previously unknown group - 'Strugglers for the Unity and Freedom of the Levant'. Their statement said that he was killed because he was one of the 'enemies of Arabism in Lebanon'. That is sure to point the finger at Syria. But why - if you are Syria - leave such a huge fingerprint? You might as well say 'he was killed because he was an enemy of Bashar'. Bashar's recent speech was laden with references to 'Arabism', and it seems today's claim of responsibility is a direct and very obvious attempt to lay the finger of blame at Syria's door. In the biggest and most important assasination since the killing of Rafiq Al-Hariri, Jubran Tueni was killed by a car bomb this morning in East Beirut. Coming just a day before the UN Security Council discusses Syria, a massively prominent figure in Lebanon's anti-Syria camp has been killed. He was editor of An-Nahar, the right-wing Beirut daily newspaper, as well as being a Beirut MP in Hariri's Future bloc. It's questionable how much actual harm he did to Syria, acting more as an angry journo than political activist. But his killing is bar far the most prominent since February 14th. So the question is - was Syria responsible? There are echoes with the attempted murder of May Shidiac days before Mehlis's first report. She is an 'anti-Syrian' talk-show host on LBC. So why are celebrities being targetted? Why not the henchmen of the political right? The question is - if Syria was responsible, why not target someone with more influence, and more power on the ground, instead of spokesmen and women. And if you've made embarrasing compromises to placate the UN and the international community - why target these very obvious 'enemies' one day before the UN Security Council is due to discuss your future? Today's murder raises the very real question that many in Lebanon and Syria have suspected for months - that the new era of political assasinations has nothing to do with Syria (why did Syria suddenly start on Feb 14th 2005?). Rather, it is an event to set the scene for tomorrow's Security Council debate. An event which will all but guarantee sanctions are imposed. Lebanon has been a pawn in other countries' battles for centuries. And doubtless, that'll be in evidence tomorrow in New York. UN investigator Detlev Mehlis is due to announce that the five Syrians interrogated in Vienna are now 'suspects' and not witnesses in the murder of Rafiq Al-Hariri. It comes as Lebanese PM Fouad Siniora says he wants a trial with an 'international character' to deal with the Hariri killing because it has 'gone beyond personal assasinations'. He also says he wants the trial to look at the killing of Jubran Tueni who was killed today. UN Secretary General Kofi Annan has expressed outrage at the killing of Jubran Tueni, one of Lebanon's most far-right editors and politicians. Druze leader Walid Jumblatt says that the 'same forces' that killed Hariri were behind the Tueni killing. Syrian Information Minister Dakhlallah says Syria was not behind the 'despicable' act. An-Nahar editor, and Beirut MP Jubran Tueni has been killed. He died in this morning's bomb, which the Syria News Wire reported earlier. 3 people are thought to have died this morning as a car bomb rocked Eastern Beirut. It's thought an official convoy was passing through the area. Several others are thought to have been injured in the bomb in Mekallis. Detlev Mehlis's final report will claim that Syria killed Hariri. It will provide more evidence than the previous report (Mehlis denies that the previous report is flawed because the central witness withdrew his testimony), as well as claims that Syria failed to co-operate. Given the politicisation of the Mehlis investigation, and the political maneouvering of the neutral investigator, many will ask whether his words were - this time - inspired by malice. Just days before Detlev Mehlis delivers his final report, Syria has claimed that it has fully co-operated with the investigation. "Syria has fully cooperated with the international commission of enquiry ... to cut the road to those who would try to use this enquiry to political ends against Syria and the region," Syria's Foreign Minister Walid Muallim said. Mehlis's previous report criticised Syria for failing to co-operate, even though he had announced publicly just days earlier that Syria HAD co-operated. This time his venom is sure to be stronger: he accused Syria of acting like a communist east European state when it televised Mehlis's only Syrian witness retracting his testimony. Mehlis's previous report relied heavily on that witness. The interrogation of 5 Syrian witnesses is taking place in Vienna, Austria. It is expected to take 3 days. All of the Syrians have been given guarantees that they'll be allowed to return to Syria after the interviews. The five men were implicated by UN Investogator Mehlis in his investigation into the murder of Rafiq Al-Hariri. But one other - who hasn't been named - was not summoned to Vienna by Mehlis. Syria fought to get the interviews in Austria rather than Lebanon, because it wanted it to take place on neutral territory. Gunmen in Aleppo have blown up their car after being trapped by Syrian security services. It's thought there were three miltants in the car. Syria has been tracking down fighters in recent months, under pressure from the US - there have been a number of clashes. Lebanese police have discovered a grave with 20 bodies in the Bekka Valley. The bodies were soldiers, feared to be war-dead. But already the fi nger of accusation is pointing at Syria. Lebanon fought a bloody civil war for 25 years, with all factions murdering each other - the Bekka was a stronghold of Hizbollah, the Druze and the Christians. But immediately the Syrians are being blamed. Syrian maintained one of its intelligence headquarters in Anjar until April this year - the strategic location is very close to the Syrian border, and was seen as a buffer point to stop the fighting spreading across into Syria. In an astonishing political display, UN Investigator Detlev Mehlis has hurled abuse at Syria after his star witness 'Hossam' denied his evidence live on Syrian TV. He blamed...SYRIA! He accused Syria of getting involved in Eastern European propoganda. And he denied that Hossam was his main witness. Hossam was the only Syrian who fingered Syria - he was a Kurdish Syrian Intelligence officer who said that Syria bought the weapons for the Hariri murder. But he now claims he was bribed by Saad Al-Hariri. During the Lebanese election campaign Hariri also faced bribery claims - many of his opponents withdrew from the election and Hariri run completely unopposed in Beirut! Syria Comment's Josh Landis reports some interesting nuances pointing to the authenticity of Hossam's TV appaerance. If it was a staged performance, why would Syria make Hossam talk about the 'Alawi government' - a massive taboo in Syria.